Whatever your fitness level or past boot camp experience, we’ve got room to grow for you here! At Fit Farm, we’re not a five star hotel – we’re a FIVE MILLION STAR boot camp! Our room options and on-campus village provide the best in modern amenities, while freeing you up to explore our amazing countryside campus nestled in the hills of music city under the stars! 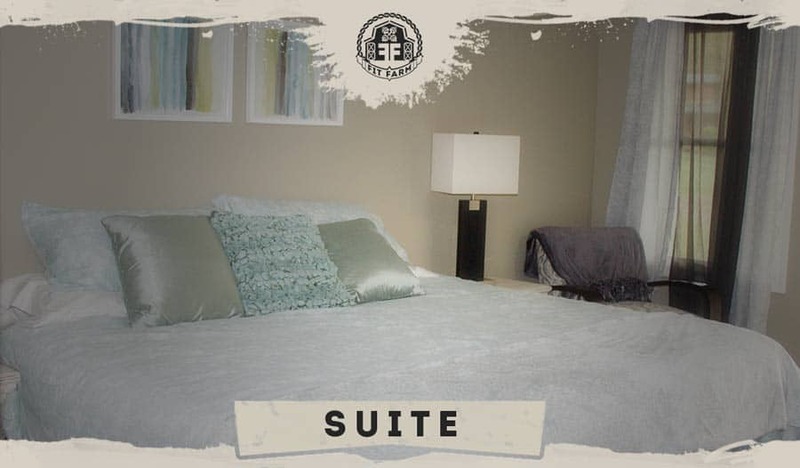 Explore our room options below and find the perfect fit for your style and accommodations! And rest assured,… when you check in at Fit Farm, there’s a lot to check out! * Rates indicated are per person, per week. Additional occupants may be requested upon availability and at an additional cost. 284-square-foot room with full beds (divider for privacy), separate vanity and shower rooms, sitting area, 48-inch TV, and connected to 288-square-foot common area. 200-square-foot room with full bed, private bathroom, sitting area, 48-inch TV, and connected to 288-square-foot common area. 284-square-foot room with king-sized bed, private bathroom, washer and dryer, sitting area, refrigerator and drink station, 52-inch TV, and private entrance. Fit Farm was built on the foundation of great fitness principles brought together by some of the best trainers in the country. Unlike many other alleged boot camps, our program brings a minimum of 7 hours of rigorous, distraction-free, training per day to your door step. We work with you from the moment you arrive, regardless of your current experience level, to make sure your time here doesn’t “slip between the cracks” like so many stories we’ve heard from other camps. At the end of your stay, if your key fitness metrics haven’t improved, then we will refund your money. That’s the Fit Farm promise, and something you’ll NEVER hear another camp say.